Green Humour debuted on the international comics platform 'Gocomics' in December 2013, making it the first series of cartoons and comic strips from India to be distributed internationally. 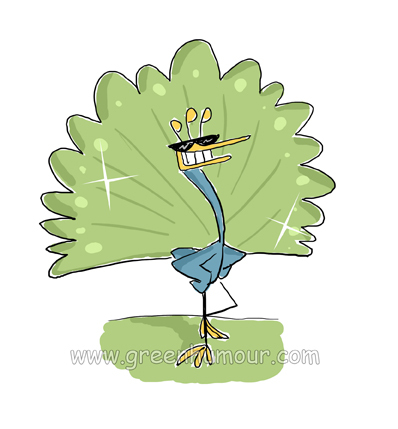 Art from Green Humour has been used for several conservation campaigns and publications by organizations such as WWF, The Wildlife Trust of India, the Nature Conservation Foundation, BNHS, The Humane Society International, The Arunachal Pradesh State Forest Department, The Karnataka State Forest Department, Birdlife International, Save our Seas Foundation, and the International Crane Foundation. The series has won awards by the UNDP, Sanctuary Asia, WWF International and the Royal Bank of Scotland. The cartoonist is a fellow of the International League of Conservation Writers, since November 2015. Notorious for rolling up into a ball like a pangolin to avoid answering the phone or meeting people, Rohan is a cartoonist, illustrator and animation designer hailing from Nagpur, the 'Tiger Capital of the World'. A memorable encounter with a beautiful tigress bathing in a Nagzira Wildlife Sanctuary waterhole led him to give up a career in dentistry and take up drawing for wildlife and conservation. Other than Green Humour, he has done cartoons and illustrations for several other publications and organizations such as WWF, Nat Geo Traveller, IDFC, Standard Chartered Bank, Titan, Istock, and has served as an animation designer and illustrator for a Bangalore-based multimedia firm. Other than the awards for Green Humour, Rohan stood 2nd in UMO's 6th International Cartoon Contest and The Time's of India's national level cartoon contest, 'A Day in the Life of India'. He isn't quite comfortable with writing about himself in the third person, but if it makes him sound like a big deal, why not? Hey Rohan, superb art !! You do an amazing job in not only amusing us with "green" humour but also educate us at the same time. Kudos!